About a year and a half ago I was meeting friends at craft beer bar down in Encinitas, CA. Nothing on their menu seemed especially exciting to me, but there was one IPA with an interesting name that caught my attention. Everybody’s Juicing was an intriguing enough name to garner my interest, and I ordered a round of the beer for my table. It looked like Tropicana orange juice and tasted like a fruit smoothie mixed into beer. It was our introduction to NE Hazy IPA’s, and it was delicious. How was I to know that it’d take 18 months to find another one I liked? No matter what company’s version I sampled, I could not find a hazy IPA that was as good as Burgeon Brewing’s Everybody’s Juicing. Not till last week anyway, when I finally cracked open a can of Mikkeller Brewing’s Misty Elliot and had a reminder of how good the style can be when done right. Exceedingly fruity, tropical and bright, the coworkers whom I shared the pour with (we work in a brewery, in case you were picturing a bunch of coeds getting drunk around the water cooler and dancing on the break room table with lamp shades on our heads) were just as impressed as I was, and that’s namely because a very well done NE IPA is harder to come by than you may think. Easy to do but hard to do right, a mediocre hazy can turn you off to the style and send you right back to the west coast IPA in no time. Of course, if hazies didn’t have their fans, then every brewery in the nation wouldn’t be cranking them out and adding them to their tap selection. But it seems a lot of brewers seem intent on creating a style of hazy that bridges the gap between NE and West Coast styles, adding a bold bitterness that takes away from what makes hazies so appealing to its fans in the first place; the candy-like aspect of the beer. 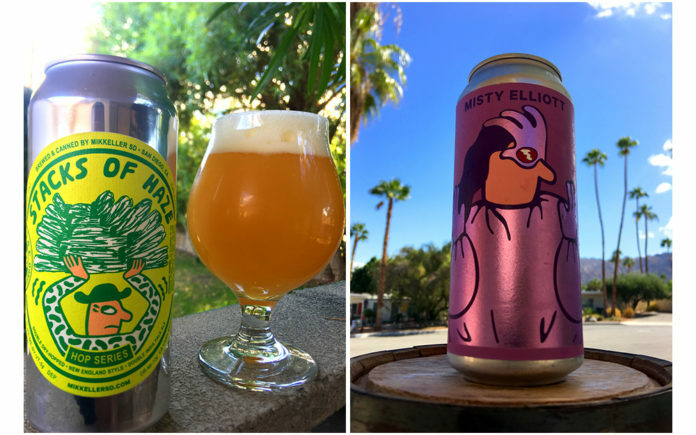 While Mikkeller nailed that profile with Misty Elliot, the brewery missed the mark just as widely with its Stacks of Haze IPA, a drier, slightly bitter, and decidedly less candy-like concoction. While a traditional IPA might hide many flaws with its massive hop character and bitterness, the New England style embraces a soft acidity and hopping rate that is supposed to leave very little bitterness. In short, it is a less forgiving style of IPA to brew, and it can expose a brewer’s talents or lack thereof. Although I initially viewed the style as a fad not worth investigating, I finally folded to the pressure and brewed my first hazy for Brewcaipa Brewing Co. Using a bit of advice as bestowed to me by veteran consultant and brewmaster Chris Anderson, I kept my malt bill simple, using only pale ale malt, white wheat, oats, and a touch of lactose for body and a hint of sweetness. I chose Azacca, Amarillo, and El Dorado hops to add those impressions of fruit flavor that Damaris talked about. A blend of English and American yeasts to add a touch of fruity esters while retaining a fairly clean character. While my own take on the style is an homage to the qualities that make a soft and juicy NE IPA, it’s really just a reflection of my tastes and what I find appealing. Homebrewers looking to try something different can find a wealth of information on ways to brew a hazy IPA and get the kind of flavors out of it that they’re looking for. Next week’s article will discuss how to brew your own swirling, juicy IPA. Next articleACCIDENT? YOU MAY NOT NEED A LAWYER!